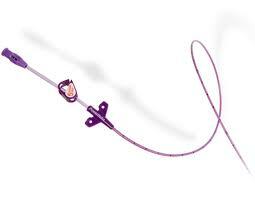 Many patients in intensive care units, children included, require what we call a central venous catheter (line) or CVL. This is a plastic tube that enters the skin at one of several places — the neck, upper chest, arm, groin — and has its tip end up in one of what are called the central veins. Here’s what such a line looks like. The pointy end goes into the patient. This particular one only has one tube, called a lumen. But we often use lines with several lumens, all contained within the same overall size tube. It’s like having two or three CVLs simultaneously. Then central veins are inside the chest just outside the heart. 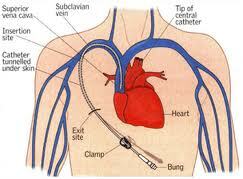 Here’s an illustration of what they look like and shows the various approaches we can use to insert a CVL. The picture shows a subclavian approach — the vein under the collar bone. But we can use the veins in the arms or in the neck as well. Or, as is common in children, we can use the vein in the groin and approach the heart from below. CVLs allow us to do several things. We can take blood samples without sticking the patient with a needle. This not only spares the patient a painful stick, it allows us to sample the blood in the central vein, which is often important. We can make useful measurements of the pressures inside the central veins, a key thing to know when caring for many patients. Because of the high blood flow inside the central veins, CVLs allow us to give medications that would burn or damage the inside of smaller veins like those in the hands and arm. CVLs are important tools for managing ICU patients. But they are not without risk. Their tips can wander into places they should not go. More commonly, the CVL can provide a highway for bacteria living on the skin to gain access to the inner organs of the body. These bloodstream infections can be very serious, even lethal. Some years ago research suggested very simple measures can reduce the chances of a patient with a CVL getting such a serious bloodstream infection. The measures are decidedly low-tech and common sense. Even though you are wearing sterile surgical gloves when you place a CVL, wash your hands before you start. Wear a full-sized sterile gown. Clean the patient’s skin off thoroughly. Use sterile drapes and barriers so that bacteria from the area outside the immediate CVL site don’t crawl into the sterile field. Finally, use a checklist to make sure the person putting in the CVL follows all the steps. This is all very simple stuff. Yet the effect of adhering to the protocol is to reduce the rate of infection. The Centers for Disease Control (CDC) recently documented a nationwide reduction in CVL-associated infections.